My girls’ scout troop had a great campout planned last weekend. A chance to get away from it all, connect with nature, disconnect everything else… We’d really been looking forward to it. So it should come as no surprise that plans got switched up, pushed back, and in some cases put altogether on hold until further notice. Thanks to the never ending rains that even now continue sweeping cross our area, washing over the land in one rising flood after the next, EVERYONE’S plans are getting tossed around. Can’t get home past the flooded roads and go camping first thing in the morning ? No problem-let’s camp on the floor of mom’s office! Power’s been out all day? No problem-let’s read books by candlelight! Tired of being stuck indoors while it’s raining? No problem-let’s go out in the break in the rain! Nothing to do? As if! spotted an EAGLE’S nest in the neighbor’s yard and watched three eagles soar through the sky! 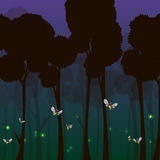 Counted dozens of fireflies at play in the tall grass at twilight! Watched our ducks SWIM in their duck run – it’s more of a pond now really. And they love it! Made glowstick necklaces for nightlights! Had cookie butter sandwiches for dinner! Took turns reading stories to each other by glowsticklight at bedtime. We discovered technology takes longer to charge in the car too. And the power stayed out. All the way into Saturday afternoon. In the meantime we enjoyed another great adventure. One that we might never have experienced if things had gone according to plan.